Liborio Napolitano was 21 when he went to work at Wittenoom. The money was good and he believed the sacrifice of leaving his fiancée was worth it to invest in their future together. He knew nothing about the health risks from asbestos and it was only years later as he saw his former workmates die one by one from asbestos-related diseases that he began to realise that his own days might be numbered. This cast a cloud over his life until he did indeed fall ill with mesothelioma, succumbing to the disease in November 1994. Before he died he launched a successful court case for compensation, fueled by anger to ensure that his story would be told so that others could learn from his experience. His widow Angela tells his story. The download speed is dependant on your internet connection. The audio may take a few moments to load. Liborio Napolitano’s reaction to the diagnosis of mesothelioma had been one of anger at the company CSR – anger at their responsibility for his unwitting exposure to the deadly asbestos and anger at their tactic of trying to buy people’s silence through out of court settlements. Taking his case to court meant spending his last weeks fighting for what he saw as an important point of principle. He emerged victorious, with the satisfaction of knowing that his speaking out might make things easier for other victims in future. Though under sentence of death Liborio Napolitano was determined to tell his story and to fight for compensation through the courts. What made his case unusual was that he sought compensation not only for the physical illness but also for the years of depression he had suffered induced by the fear of falling ill. This was the first time such a case would be taken to court. Liborio Napolitano was 21 when he went to work at Wittenoom. He knew nothing about the health risks from asbestos and it was only years later as he saw his former workmates die one by one from asbestos-related diseases that he began to realise that his own days might be numbered. This cast a cloud over his life until he did indeed fall ill with mesothelioma, succumbing to the disease in November 1994. Here his wife Angela talks about what happened when he heard the news of his diagnosis. Liborio tried his best to lead a healthy life, but the fear of falling victim to an asbestos-related disease permeated his life. And then what he had most dreaded came to pass – an inflammation of the lungs was eventually diagnosed as mesothelioma. The Wittenoom operations closed in 1966 and by the 1970s there was more and more talk of the dangers of asbestos exposure. 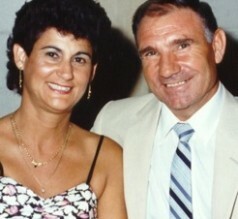 Liborio Napolitano began to see his friends and former Wittenoom colleagues fall victim to asbestos-related diseases and this made him very fearful that it would be his fate to succumb to asbestosis or mesothelioma himself. For a young man in the 1950s Wittenoom offered good prospects. Two years’ work there would allow someone to earn enough to set themselves up in life. So it was on this basis that Liborio Napolitano accepted a two year contract, believing that the sacrifice of having to leave his fiancée Angela for that period would make it possible for them to marry when it came to an end. Angela describes what he found when he got to Wittenoom.